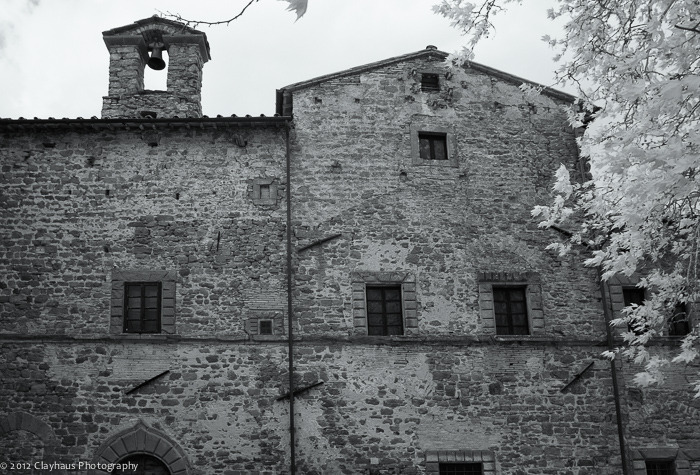 Castello dei Conti Ubertini...what were you? Heading into the Casentino Valley via the twisty-turny Strada Provinciale 60, shortly after the hamlet of Chitignano is a narrow, dirt one-way road on the left with a rusted yellow sign next to it. “Castello dei Conti Ubertini Sec XII” it intones. A castle, 12th century...what’s not to like? Down the lane after about 100 meters is an open field and the rambling hulk of the castello, bordered by green and yellowing trees. Not the classic form of a castle, per se, but rather a pile of irregular rectangular stone boxes stacked helter-skelter. Old yes, twelfth century, perhaps, somewhere. But what I see is a contagion of styles and centuries. What it was, is clearly not what it is. Castello dei Conti Ubertini...what are you? On the southern perimeter is an old wall and perhaps a ditch. Was this part of some long-lost defensive design? 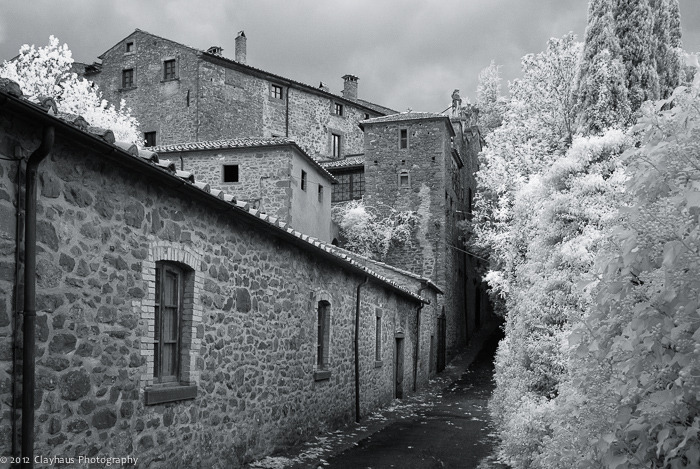 On the north side the narrow ribbon of a lane continues, cast in shadow by the tall, overgrown trees and the looming outer façade of the structure. Structures with a plural ‘s’ is likely more accurate as there are clearly multiple buildings that have grown together in some organic though seemingly chaotic fashion. Walking up the lane and into the shadows, heavy fortified windows peer downward whilst higher, mounted on a decoratively curving upper wall, stand six to seven Renaissance figures. The angle is so acute that I cannot guess whether the figures are male or female, filled with gaiety or glowering with menace. They are just there and probably have been for some 400 years. 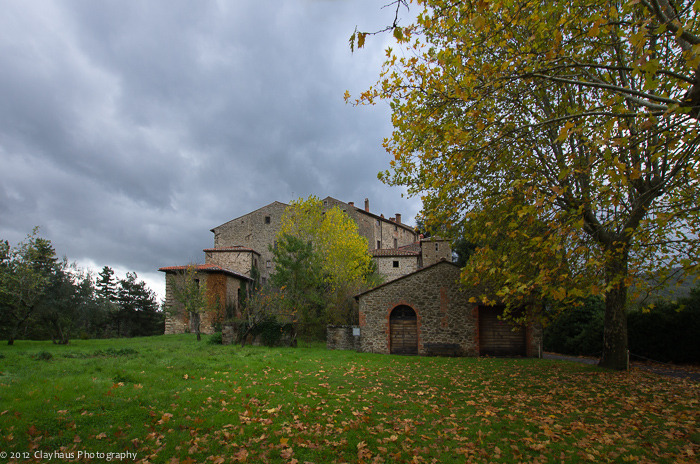 With roots extending over a millennia, the castle is recorded to having belonged to the Count of Chiusi (an old Etruscan town) in the early 13th century. In 1262 it passed into the control of the Counts of Ubertini. Ghibelline supporters of the Holy Roman Emperor, they were defeated at the Battle of Campaldino in 1280 by the Guelph (supporters of the Pope) Florentine forces and the castle (and much of the Ubertini possessions) passed to the Bishop of Arezzo and the Guidi family of Florence. The castle was restored (modernized) in the 16th century and though it is now privately owned, with prior arrangements it may be toured.